Building of a theses and dissertation collection was commenced in the latter part of 1999. 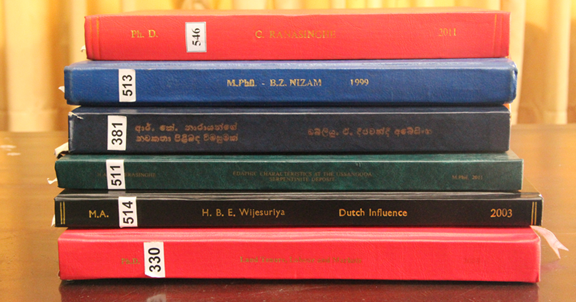 The theses/ dissertation submitted to obtain PhD, M. Phil, MA, MLS degrees from a recognized university or a similar institution in Sri Lanka or abroad by Sri Lankans are acquired. The subject for the theses should be relevant to Sri Lanka. Theses/ dissertation submitted after 1980 are given priority in acquisition. At present this collection consists of a large number of theses. This collection is kept as a special collection for reference and research.